European angler Tom visited the Barramundi fishing ponds Bangkok for a days lure fishing at the start of his Thailand fishing holiday. On arrival at the Barramundi fishing ponds the angler wasted no time in casting into one of the nearby fishing ponds to be met with a take almost instantly. With the light weight fishing rod bent into its full curve the angler carefully played the first Barramundi towards the waiting net. Moments later the fish was in the grip of the boca grip and carefully unhooked before being released back into the fishing pond. Further casts into the various Barramundi fishing ponds resulted in equally aggressive strikes as the voracious Barramundi slammed constantly into the lures thrown into the fishing pond. Tom caught fish steadily throughout the day on a variety of Cultiva and rapala lure patterns which he fished in the various fishing ponds on the Barramundi fishing Bangkok complex. Each time upon hooking the fish, the Barramundi would acrobatically throw themselves from the water in amazing head shaking and aerial displays as they attempted to rod themselves of the anglers lures. 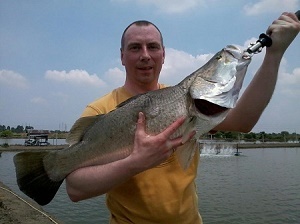 As the days lure fishing in Thailand continued the Barramundi slowly got bigger with several fish approaching the 6kg region. With the hectic Barramundi fishing action pretty much non stop throughout the day Tom had soon amassed a massive twenty five fish capture of Barramundi with several specimens estimated to weigh over 6kg’s.